Blog I've Got This Lump on My Foot-What Could It Be? I've Got This Lump on My Foot-What Could It Be? As foot and ankle surgeons, we are asked this question quite frequently. 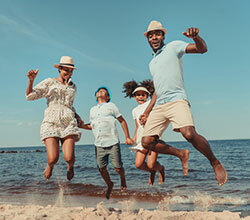 We always explain that because bumps on feet can signal both serious and non-serious conditions, it is always best to have all lumps and bumps properly examined by a foot and ankle surgeon. The most common type of lump found in the foot is a soft-tissue mass called a ganglionic cyst. This soft, fluid-filled sac is a benign (noncancerous) bump found on the tendons and joints. A ganglionic cyst can be caused by a leaking of jelly-like fluid from the "capsule" surrounding a joint or tendon and may be located on the top of the foot, near an ankle joint or even on the side of the foot. The cyst will not go away on its own and tends to return, even after being drained. The best way to keep a ganglionic cyst from recurring is to have it surgically removed by a foot and ankle surgeon. Remember, foot bumps do not tend to go away on their own. The sooner we are able to properly evaluate the bump, the sooner a patient can have peace of mind and move forward with treatment, whether surgical or nonsurgical, so they may resume everyday activity. If you or someone you know has a lump or a bump, please give our office a call for an evaluation, 440-442-3113! 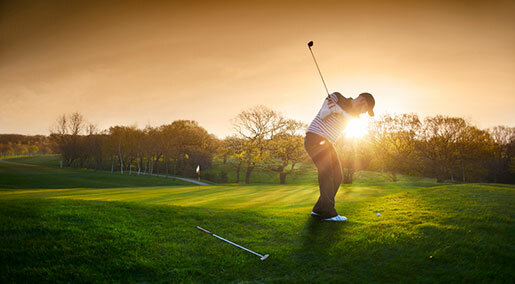 With the Master’s Tournament this weekend, many of you will be itching to get out onto the golf course, therefore, do not let foot pain prevent you from doing so. The barrier to a perfect golf swing could lie in your big toe. Or your heel. Or on the ball of your foot. These are the three areas of your feet most likely to cause pain that can ruin your golf swing. Neuromas are nerves that become thickened, enlarged and painful because they’ve been compressed or irritated. A neuroma in the ball of your foot can cause significant pain as your body transfers its weight from one foot to the other in a golf swing. Several other painful conditions can also cause instability during your swing. Some athletes and former athletes develop chronic ankle instability from previous ankle sprains that failed to heal properly. Motion-limiting arthritis and Achilles tendonitis can also affect your balance. Ill-fitting golf shoes may cause corns and calluses that make standing uncomfortable. For the majority of golfers and other patients, simple treatments including custom orthotic devices (shoe inserts), stretching exercises, changes to your shoes, medications, braces, steroid injections and/or physical therapy is warranted. However, if these conservative measures fail to provide adequate relief, surgery may be required. Foot pain is not normal. With the treatment options available, a pain-free golf swing is clearly in view, so please give our office a call, 440-442-3113. Got gout? 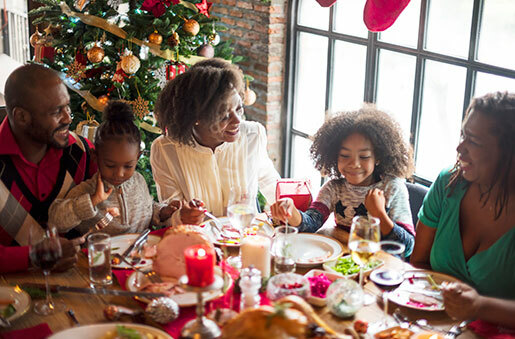 If so, we have some recommendations for surviving the holidays: Watch what you eat and drink! Changes in diet, including overindulging in certain foods and beverages, can cause gout attacks this time of year. Gout attacks are extremely painful. They are caused when uric acid accumulates in the tissues and/or a joint and crystallizes. This most commonly occurs in the big toe joint. This is because the toe is the coolest part of the body and uric acid is sensitive to temperature changes. Foods that are high in purines contribute to uric acid build-up. If you are prone to gout attacks avoid purine-rich items, such as shellfish (shrimp, crab, etc. ), organ meats (kidney, liver, etc. ), red meat, red wine and beer. Gout can be treated with medications, diet changes, increasing consumption of appropriate fluids and immobilizing the foot. In some cases surgery is required to remove the uric acid crystals and repair the joint. For more information or if you are experiencing an attack, please give our office, 440-442-3113, a call. We are here to help! 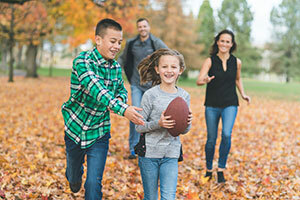 If your children are playing sports this fall, pay attention to six tips that could protect them from serious ankle injuries. 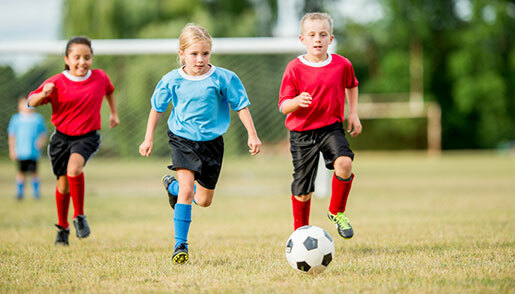 Every fall, our office notices an increase in ankle injuries among young athletes. Football, soccer and basketball are the sports most likely to lead to sprains, broken bones and other problems. Our top recommendation for parents is to get ankle injuries treated right away. Please feel free to contact our office, 440-442-3113, with any questions, concerns and/or to set-up an appointment. For more information on treating ankle sprains, visit the American College of Foot and Ankle Surgeons' patient information web site, FootHealthFacts.org. Soccer season is in full swing and our practice strongly urges parents and coaches to think twice before coaxing young, injury-prone soccer players to “play through” foot and ankle pain. Skeletally immature kids, starting and stopping and moving side to side on cleats that are little more than moccasins with spikes are a recipe for foot and ankle sprains and worse. Kids will play with lingering, nagging heel pain that, upon testing, turns out to be a stress fracture that neither they, their parents nor their coaches were aware of. By playing with pain, they can’t give their team 100 percent and make their injuries worse, which prolongs their time out of soccer. Quick, out-of-nowhere ankle sprains are also common to soccer. Ankle sprains should be evaluated by a physician to assess the extent of the injury. If the ankle stays swollen for days and is painful to walk or even stand on, it could be a fracture. Collisions between soccer players take their toll on toes. When two feet are coming at the ball simultaneously, that ball turns into cement block and goes nowhere. The weakest point in that transaction is usually the foot, with broken toes being the outcome. The toes swell up so much the player can’t get a shoe on, which is a good sign for young athletes and their parents: If they are having trouble just getting a shoe on, they shouldn’t play. For further information about various foot conditions, contact our office, 440-442-3113 or visit FootHealthFacts.org, sponsored by the American College of Foot and Ankle Surgeons. We are here to help and keep your children playing! Walking is great exercise and one of the most reliable forms of transportation, however, if your feet aren’t in the best shape or you don’t have the right shoes, too much walking can cause foot problems. If you’re not accustomed to long walks, start slowly and rest if your feet start hurting, however, above all, have fun!!! Contact our office, 440-840-0616, for more information. We are here to help! Your feet are easy to forget. Especially after a winter of wrapping them in wool socks and heavy boots, it can be hard to remember to take care of them. But this neglect can take its toll: a winter’s worth of wear can lead to dead skin build-up, leading to unsightly calluses and possible corns. Be sure to take care of these with a pumice stone or foot-file, and make sure to wash and dry your feet thoroughly and regularly. Are you moisturizing? You should be! After an entire season without much exercise, it can become clear quickly that your body just isn’t used to moving like it was last Autumn. Jumping into physical activity without proper preparation can lead to some serious issues, like plantar fasciitis and other tendon-based problems. It’s important to build up to your activity peak gradually, and warm up to each new adventure. For a full list of foot-prepping stretches and strength-training exercises, make an appointment with our office. We will help you get on your feet and stay there all summer long. Your feet take a lot of punishment. Without the proper shoes and orthotics, the build-up of damage on your feet and ankles may culminate to something that requires more in-depth treatment. Fortunately, we can help can prescribe the right shoe for the job! We are equipped with the know-how to get you the orthotics you need for the adventures you love. A proper orthotic is invaluable– preventing everything from microfractures to tendon issues and more. 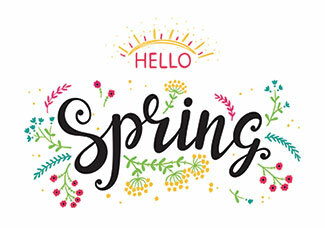 If you have any questions about proper springtime footcare, don’t hesitate to give our office a call, we are here to help, 440-442-3113! We have the knowledge and expertise to keep your feet strong this and future seasons! From the rush of downhill skiing and snowboarding to cross country skiing to ice skating, cold weather sports provide a fast track for fun and cardiovascular heath, but the colder temperatures and exhilarating speeds attained during such sports can expose your foot and ankles to debilitating injuries. Healthy feet and ankles act as accelerators, brakes and shock absorbers in winter sports and help keep the body upright and out of the line of danger. Therefore, avoiding foot/ankle problems is key to full enjoyment during these activities. Proper footwear, insulated, waterproof boots or shoes, and thick cotton socks, to wick away moisture is as important as coats, hats and gloves during cold weather activities. Is the single most important factor in safe and successful skiing and ice skating. Without a snug and accurate fit, the pressure exerted from constant forward motion and side movement of skiing and quick turns of skating can result in discomfort and injury. 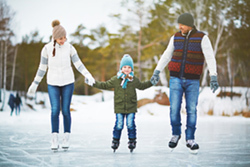 Additionally, boots or skates that are too big can cause irritation in the toes due to excess motion or ones that are too small can inhibit circulation to the toes and cause cold feet. Stretching the lower extremity prevents muscle pulls and tears and prepares the muscles for the movements required in the activities. Follow the tips listed above and enjoy the remainder of this winter season. If you have sustained an injury during a winter sporting activity please give our office a call, 1-440-442-3113, we are here to help! Osteoporosis is frequently referred to as the “silent crippler” since it often progresses without any symptoms or isn’t diagnosed until a person experiences pain from a bone fracture. The porous nature of bones in people with osteoporosis makes them more susceptible to bone fractures, especially in the feet. Because the bones are in a weakened state, normal weight-bearing actions like walking can cause the bones in the foot to break. Diagnose of osteoporosis is made through bone densitometry tests, which measure calcium and mineral levels in the bones through low-dose radiation x-ray, or possibly through a routine x-ray. This is why prevention and early intervention are key; women should make sure bone densitometry tests are part of their wellness examinations when indicated by their physicians. If you are suffering from foot pain or suspect you may have osteoporosis, please call our office, 440-442-3113. We are here to help!